It’s of up-and-coming Glasgow band Blank Canvas, who were for me one of the highlights of the Doune The Rabbit Hole festival. 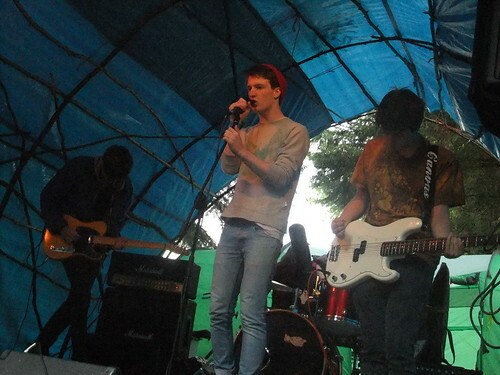 I was up on Saturday and the band played in a wee tent (as you can see) in a clearing in the woods. I wish there was a Youtube filter or something that could let you know easily if a ‘video’ was an actual video. It’s not great surprise to me that there’s nothing for Frog Pocket – that I can find – even though John Charles Wilson (yup, his actual name) had an album released on Planet Mu – a ‘big’ label unlike his own Mouth Moth. However, this one gets the nod because, for some unfathomable reason, it’s introduced by Ivor Cutler (more of him in future weeks I’m quite sure). There are many Aztec Camera tunes I could have chosen as well, but the guitar solo on this one is what sets it aside from the rest. This is a tricky one. The video is from a lager advert, and only lasts a minute. The actual single – which people kind of forget about – is three minutes of should-have-been-a-hit pop genuis. (The band grew out of Fire Engines and eventually became the Nectarine No. 9). Saw this lot the other night, supporting Happy Particles. Their album, maybe 10 years in the making, got some criticism for being a bit underpowered. Which I can see the argument for. This is maybe the longest tune/video I’ve featured so far. Esperi is the stagename of Chris Lee-Marr, a Dundonian multi-instrumentalist who I think I first saw live at Wickerman 4 or 5 years ago. There are a few videos of him – including a very funny one which sadly features too many dogs for my liking – but this captures what his live shows are like given that he tends to build loops up to eventually create the full band sound you can hear. (Actually, I’ve not seen him live for a bit, could well be that he’s got lazy and just hires in loads of musicians instead. Probably not though). Couldn’t find anything from their fine debut album online either, but as it happened this is well worth sharing, even if it sounds quite far removed from their old sound (this is actually not unlike current plat de jour, Happy Particles – who were headlining last night).